1. Begin with properly fired Bisque. Moisten a clean sponge and wipe bisque to remove any dust. 2. Slightly thin FN-020 Medium Green and pour inside the camper. Turn to fully coat the inside then pour out the excess glaze. 3. Using a felt tip pen, draw in a line on the body of the camper to separate the red and white areas. Use the Soft Fan and Script Liner to apply three slightly thinned coats of SC-73 Candy Apple Red to the red areas of the camper. Apply two thinned coats of SC-27 Sour Apple to the green areas. 4. Use the same brushes to apply three coats of CG-992 Mint Chip to the awning. Press open circle shapes on the awnings with SC-73 Candy Apple Red. 5. Draw in with a felt tip pen the scalloped shades in the windows and the shading detail in the door window. Float SC-30 Blue Dawn on the window sections. Use SC-73 Candy Apple Red to stripe the shades in the front windows and SC-27 Sour Apple and Candy Apple Red for the door window. 6. Using the negative space from snowflake punches, wet the area for application and press the paper onto the camper. Brush top coat of SC-16 Cotton Tail over the space, remove the paper. 7. On the white areas of the camper, brush a coat of SC-16 Cotton Tail in the area of the snowflake. Press the paper onto the piece then apply two coats of SC-73 Candy Apple Red over the area. Remove the paper. Check out the size used from the photo. 8. Use the Liner to outline the sections of the camper, the windows and door frames with SC-15 Tuxedo. 9. Use the Script Liner to apply two coats of SC-15 Tuxedo on the tires, trailer hitch, and underbody. 10. 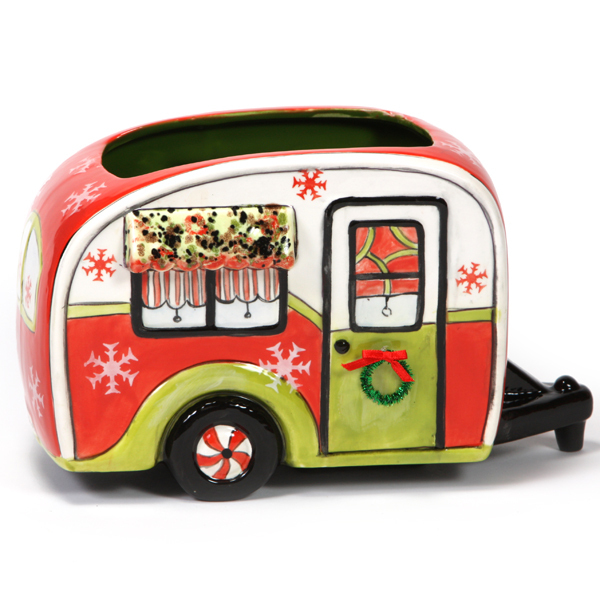 Dip into Clear Glaze or use the Soft Fan to apply one coat of S201 Clear Brushing Glaze onto the outside of the camper (omit the awning). 11. Fire to cone 06.